The economy is a forest. Individual stocks are like trees. Most of us focus on specific assets and the markets they inhabit. A basket of stocks in the S&P 500, for example. If you’ve chosen well, and your picks show nice returns, that hyperfocus might miss trends that say it’s time to run for cover. Those trends show up in the real-world economy before they affect stock markets. But warning signs exist even in stock markets …. if you know to look for them. I looked … and those warning signs are flashing fire-engine red. Learning to interpret them could help your portfolio survive the next recessionary fire. Let’s start with an indicator that reveals what’s going on in the “real” economy of physical goods and nonfinancial services. It leaves out the FIRE sector (finance, insurance and real estate). Gross value added of nonfinancial companies after inflation measures the net value of goods and services produced after adjusting for production costs. When it’s negative, it means companies aren’t making money from selling their wares. If they’re showing profits in their quarterly reports, it’s coming from somewhere else — cost-cutting, layoffs, asset sales and so on. Those aren’t sustainable. This measure just turned negative. Why should this time be any different? Think of the economy and its business cycle as a compression wave — a Slinky, for example. As economic activity increases, firms make more profit. They use that profit to invest in new productive capacity, hire workers and grow. That spending ripples out through the economy, as workers spend wages and producers of capital goods expand their own operations, and so on. Eventually, however, that expansionary wave slows down as markets become saturated. Profits start to fall — as in the chart above — and companies cut back on investment, jobs and expansion plans. That also ripples through the economy. 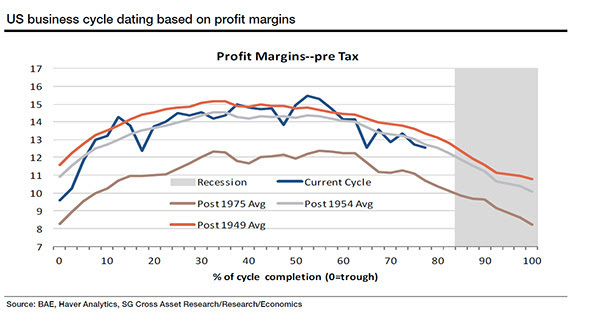 Given this expansion/contraction dynamic in the economy, we can use changes in pretax profit margins over time to get a sense of where we are in the business cycle. This pattern has held true for every recession since 1949. Why should this time be any different? When the business cycle is petering out, sending us into the contraction phase, the degree of correlation within and between price movements of various asset classes — such as stocks, bonds and commodities — begins to decline. Asset prices that usually move together start to move independently. Oil futures drop but retail sector stocks rise, for example. Transport stocks suffer but some automakers do well. When there’s a bear market, investors tend to be conservative. It’s too risky to go chasing after individual stocks, even if analysts like them. For example, if Firm A and Firm B are in the same industry, there’s no reason why one of them should perform better than the other in the short term if market conditions for each are identically weak. Sure, some firms have great innovations and break free from the pack. But cautious investors are much less likely to support such stocks in a bear market, where preserving capital is key. For that reason, correlation tends to be higher in a bear market. By contrast, correlation tends to fall during the final stages of a bull market, as stock pickers chase individual stocks that report superior results, even as the rest of the market declines. For example, Atmos Energy Corp. (NYSE: ATO), a Texas natural gas distributor/pipeline company, is soaring even though the natural gas sector is in dire straits. This isn’t just a U.S. phenomenon. In a note published earlier this week, Morgan Stanley notes that assets across the world are the least correlated in almost a decade. 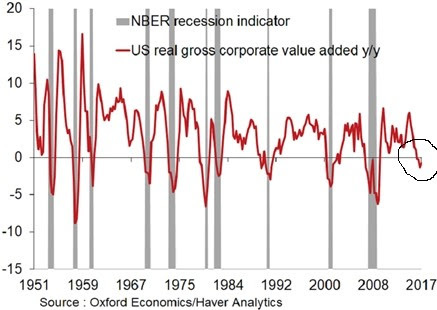 A fall in correlation is due in part to the fact that as a business cycle nears its end, fewer firms remain profitable. This can happen even if the market is still rising, but driven by a few big stocks or sectors. That’s happening right now. Fewer and fewer U.S. stocks have been rising with the market as it reaches new highs. To me, that suggests a business cycle on its last legs. Here’s the thing about forests and trees. A big tree in the middle of the forest has no idea a fire is raging on the edge of that forest. The big tree is growing well, thriving, secure … until the fire arrives and burns it to the ground. There was nothing wrong with the tree … but it still went down with the forest around it. As the business cycle winds down, which stocks will be like that big tree in the forest? Even if an investment has a lower return than the market, it can improve the performance of a portfolio if it has a low correlation to the other investments in that portfolio. When they go down, the less-correlated position stays up. We designed my Alpha Stock Alert service and the Smart Money service embedded in The Bauman Letter for low correlation with the stock market. In rigorous backtesting, they both beat the market by triple digits in the aftermath of the 2008 crisis. They’ve also done better than the current bull market. By keeping one or both of those portfolios in your larger mix of investments, you can hedge against the coming forest fire ... and make money at the same time.